Oh look mud I'd forgotten what that's like after our long hot summer! The movie comes from Poland and believe me, we do have rains and mud too. Being a pom now in Oz, I miss mud. To be honest I miss dirt all we have here in Perth is sand and pea gravel! So you're the guy that ruined these trails! Sweet video. Love that AC/DC tune too. One question...where's the mud? I saw maybe 4 little puddle splashes. Mud is thick and deep. Half the mud puddles I go through on the local trails involve sinking to the discs, getting both feet covered, and powering through it. One of my favourite sections has a mud hole almost 10 feet long, you have to get huge speed, and pull the front end up or the bike will dig in. If you lose momentum or stop the bike, your f*ckED. I don't think the point of the video was to show this guy riding through loads of mud. That was just the observation of the first few commentators. 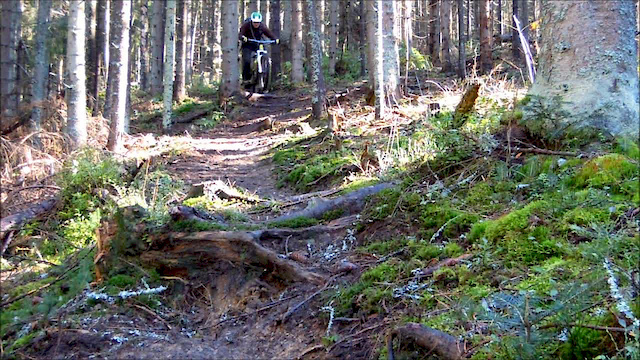 This just showed the guy riding this trail during the fall. Because otherwise, you're right. Looks like the ground was only slightly saturated from the previous days rain. We have mostly desiduous forest where i live so its not only the mud u have to deal with but ur sliding around on all the leaves makes it real knar. It also hides alot of the rocks and roots on the trail which is awsome cause u dont see it comin till ur in the ruff section makes it quite fun! Might help if i changed over my tiers tho still have the dj tiers on the bike so im just sliding most the time lol! Great vid, got me stoked to go ride! Love the choice of song..."let me put my love into you babe"...that's exactly how i feel about my bikes haha. I am stuck between 55's and Lyriks (170mm), was getting Lyriks before watching that....now back to unsure. norcal neither the lyriks or 55's are 180mm forks which makes the van/float 180 not an option... good job! the 55 titanium! feels like steel and weights like air! I have gone for the Lyriks, I have heard that the 55 are best for small to medium hits, Lyriks for medium to bigger hits... which is more me. Plus I got a great deal on the Lyriks, which was the real winner for me! I only got the small, medium, hard from riders of both forks, not from personal experience. I ride pretty hard for an old guy (when I am not in a cast from racing injuries grrrr), I love my Boxxer WC's on my Dh bike, I hope these are even 80% as good as the boxxers. I am getting a 2nd hand 2012 set, just serviced, which if I don't like I can send back. I guess next weekend will be timing between the 36 Float RC2 and the Lyrik, also climbing performance on the very technical stuff. The 36's performed well yesterday up in the mountains, with the same old flaw of having to run them too hard to get even 130mm to work on the very slow rocky technical stuff, and having to run them slightly too soft with 2 extra clicks of high speed and low speed for the technical climbing. Then they fail on the tight, slow, rocky ridges, where they end up hooking up a little too much and you have to dab rather than clean sections. Down, soft they were mint still as the damping is doing its full job. I like the longer fork for hammering the technical climbs, I do ok at my climbing etc too up in the mountains. I like the technical climbs that last 1 hour plus. I am not a fan of fire road climbs, in the likes of Spain on holiday they are fine as they get you to the top, but back home I have a DH bike for DH, an AM bike for the mountains and an XC bike (no dropper, 2.1 tyres, short travel out back etc) for thrashing around the flat stuff. Riding an AM bike up a fire road for 45 minutes on an AM bike is just not something that you would have to do over here much or at all to be honest. For technical climbs a larger fork gives better ground compliance compared to a 120mm fork on a longer travel AM bike. When you get it wrong the longer fork will let you away with more. Have the damping set correctly and it wont disappear into holes but carry over them. I think I will get the Marz, have the Lyrik and the 36, test them all and sell what does not work best for me. Nicely played. Send map please. Hey Pinkbike... great news! We've discovered that the Earth is round and it tilts a little bit! It doesn't have to be raining where you are now! Here here! Only fall in Northern Hemisphere, Southern is setting up for a mint summer! Come down and ride some sweet tracks in New Zealand. Yep, Suny and 24C in Sydney. Time for some trails. When are we going to ride there together Mariusz ? O my god its muddy.... Try ridin in it 363 days of the year! I rather would move to Spain !! Fantastic, like the bike, motivated me to get for a ride right now! the music doesn't get better than that, Long live AC/DC!!! Great video, but personally I feel it would have been much better without all the unnecessary speeding up. Are you sure that's in Poland, I thought they only rode donkeys there?? ?